Hi everyone! 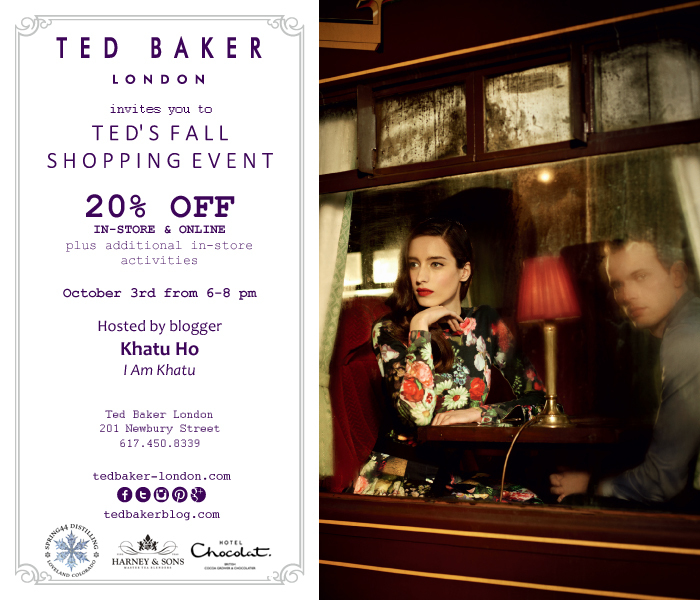 If you are in the Boston area this Thursday, Oct. 3rd, come join me at Ted Baker, 201 Newbury Street, between the hours of 6pm to 8pm for a fun evening of shopping, cocktails, and sweet treats. Shoppers will be offered an exclusive 20% off the entire FW13 collection for one night only during this event! Hope to see you there! Unable to make it? Follow along on Instagram and Twitter. I understand, lots going on this week! Hopefully we can get together soon. thanks Sami! hope to see you there. I hope the event goes well for you. I live in the UK and love Ted Baker!